“The Cooking of Parma,” by Richard Camillo Sidoli is the kind of cookbook I most enjoy. It has many marvelous recipes from one of the greatest food regions of one of the greatest food countries in Europe. It also presents a culinary history of the region, integrating the history of local foods and their preparation into the broader history of Northern Italy. 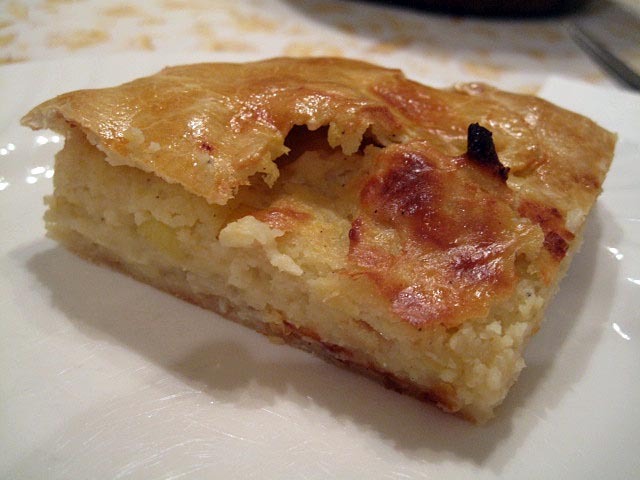 Alas, I have hardly scratched the surface of the delightful repertoire of this Italian province's cucina, but I have repeatedly made one recipe: “Torta di Patate.” This open-faced, rustic savory tart was for me an instant comfort food – perhaps because it's what a potato knish really wants to be when it grows up. In a medium mixing bowl, combine the flour and salt. Then add the water and 4 tablespoons of olive oil. Mix to form a dough, but do not over-mix. The goal is not to develop the gluten. Let the dough rest for at least 20 minutes. It can be left refrigerated overnight. Spread the remaining ½ tsp of olive oil in a 15 x 11 inch baking pan, and put the dough in the pan, leaving a 3 inch overhand on all sides. Spread the filling over the dough, and fold the overhanging dough over the edges of the filling, leaving most of the center open. Brush the torta with a beaten egg. Parma-style torta's can be filled with a variety of vegetable mixtures, and this cookbook gives recipes for several, including squash, rice and savoy cabbage. I've made them all, except for the torta di riso. We like the torta di patate best. Prepare torta dough, as above. Boil, bake or microwave the potatoes until just tender. Sauté the onions and leeks in the butter until soft but not browned. Peel the potatoes and put them through a ricer into a large bowl. Add the sautéed onions and leeks, the cheeses, milk and salt and pepper to the bowl and mix. Beat the eggs. Add ¾ of them to the potato mixture, reserving the remaining quarter to brush the torta. Assemble the torta as described above. This mixture can be used immediately or kept , refrigerated, for use the next day. Tortas are often eaten as antipasti, but we ate this as our main course for dinner, along with a green salad. For dessert --- Well, what should follow a rustic savory tart? It has to be a rustic fruit tart! Submitted to YeastSpotting on SusanFNP's Wildyeastblog. oh wow. potatoes and leeks... this sounds absolutely divine! Potatoes and leeks ... Yes! Even without the mascarpone, etc., mashed potatoes with sautéed leeks and olive oil is pretty good eating, especially with yukon gold potatoes. My mom used to make an amazing "potatoes au gratin" which she'd add leeks to and boy was it ever good!! I usually make it as a side dish (without the leeks) at Christmas dinner, but had totally forgotten about how she'd sometimes do the same thing with leeks. a single layer in a clear, large pyrex pan. 3.) Repeat with another thin layer of sliced potatoes. 6.) Another Layer of cheese, and then place a couple garlic cloves on top so that they are sort of spread out on the top. 7.) Pour in milk, fill it so that you see the milk come up to about 50% height of the layers. 8.) Cover with foil and bake at 350 degrees for about an hour and a half, until the potatoes are cooked and soft. My favorite gratin is made with a layer of sauteed leeks and fennel between layers of potatoe. Otherwise, it's similar to yours. BTW, the mix of sauteed leeks and fennel is also wonderful with baked or broiled fish (Salmon or Halibut). Marvelous, To the energizer bunny of baking!! Once I saw the first picture, I should have known it was you that had posted it. You are one of my favorite bakers on this site because you produce spectacular results again, again, again, and again. Thanks for giving the rest of us amatuers something to aspire to! two of my favorite things. Your potato torta is devine. If I had to pick my favorite fruit for a pie or tart it would definately be the sour cherrie..your cherry tart is mouthwatering. The only sour cherries I can find are sometimes at Trader Joe's or Oregon brand. What a great dinner and dessert you had tonight! mmmh...I think I'll try this one eventually! Just after posting this, I assembled the dough (used high extraction flour) and right now I've got some potatoes cooking. I'm curious about how it will turn out! I made half the batch and will bake it in a round pan, 29 cm in diameter. I liked it, it's basically mashed potatoes in dough. ;) the other eaters said as well that it's nice, but they saw it more as something to go with something than as a centerpiece of a meal. I have to say, I do agree to a certain degree, as it's basically just, well, mashed potatoes in a dough. But I really enjoyed it with some cottage cheese and a salad, it tastes nice and clean. I think it looked very beautiful, with this kind of pie shell. But what has to be said is that the pie crust doesn't remain crisp. after cooling, it's soft. But that's fine with me. As usually, my apologies for the poor picture quality. I hope to get a camera from Santa Claus this year. Your torta looks very good! This is good as a side dish, but is good enough as a main course with a salad for me. The crust does not stay crisp, but it is very good reheated/re-crisped in the oven. BTW, I used the KAF Itallian typo 00 clone for the torta crust. I think it would work well with AP flour - That's what I've used in the past. And, just in case anyone thought otherwise, the cherry tart was made with a "normal" pie crust, not the same dough as the torta di patate. P.S. If you need letters of recommendation to Santa Claus, confirming that you need and deserve a new camera, I bet TFL would fill his mail box. You have been a good girl this year, haven't you? I made the torta di patate last night. I used AP flour.. turned out very well. Next time I might add some additional seasonings to the filling. David: thanks for the recipe. I just might have to go find that cookbook. It's a good reading cookbook, if you like lots of background on the foods you cook. BTW, the torta is delicious reheated, if you can't finish it in one meal. I reheated at 425ºF for about 5 minutes then kept it hot for another 10-15 min. at 200ºF while the petrale sole was sautéing and the spinich was steaming for dinner last night. They look so good, David! 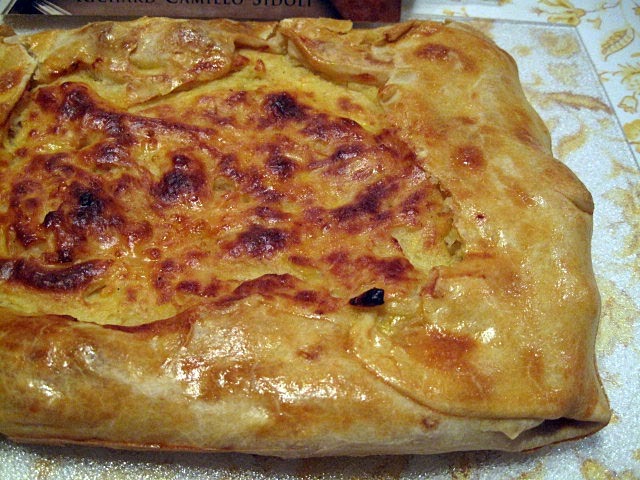 I love Italian food and both your Torta di Patate and Torta di Ciliegie look awesome. You make me hungry! I've just forfitted my right to complain about all the butter in your brioches with last night's baking. Potato focaccia is one of my favorites and one of those things that people always go "huh" about. But I know how wonderful that can be and this promises to be of the same ilk. Soul food good! Thanks for the great pictures and for sharing! mouth-watering torta, david! they look beautiful. and yes, i agree, that makes for the perfect comfort food especially here in montreal where we're getting our first real snowstorm. have been housebound all day, time to unleash some energies and make those tortas. well done, you continue to impress me. you have talents that i'm sure your family enjoys to the hilt! Wow David both of these are wonderful looking. I don't have a chance at staying on a diet with these thoughts in my head now. Fortunately, thoughts are low in calories. 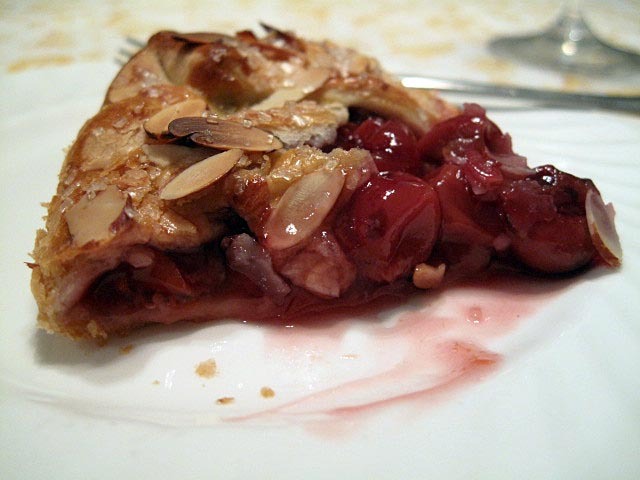 That rustic cherry tart is fab enough to make you the star of the 2010 National Cherry Festival in Traverse City. Hmmm...maybe I'll send them a link. You'd like TC in the summer, David (but probably not now, as northern Michigan's been hit with over two feet of snow in the past 48 hours). The torta is pretty awesome, too. I guess you really ought to let the Traverse City Cherry Festival folks know that the tart was made with Oregon cherries. Since it's a "national" cherry festival, I suppose they won't mind (much)? I've never been to the UP, as far as I can recall, but I do remember my parents talking about it and about the wonderful cherries from there. They were born in Detroit, as was I, and lived there until we moved to California after WW II. Well, since Traverse City is called the "Cherry Capital of the World," I imagine the cherry festival folks would prefer their own cherries, which flourish so nicely in the Lake Michigan Traverse Bay area. It's fascinating, though, that you're originally from Michigan. So is Paul (PMcCool) - although he hailed from Northern Michigan. Since it is too cold to grow cherries in the UP (although they do have an abundance of awesome wild blueberries), am guessing your folks picked up some cherries from the many stands that sprout up along the roadsides throughout northern Michigan in early summer. They may have snacked on them while they waited for the car ferry which transported vehicles across the Straits of Mackinac. 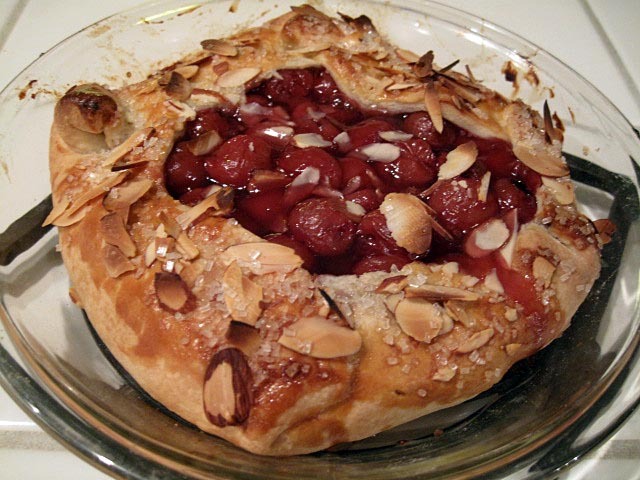 How many cherries do you need for that tart? A pound? I'll have to send you some fresh Montmorency tarts next year. Or if you prefer, black sweet cherries or Balatons. Your kind offer @ Lindy. I moved to California when I was 4 years old, but my parents entertained me and my sister on long car rides by singing songs from their student days at Ann Arbor - "Hail to the victors," "I want to go back to Michigan," etc. We get good sweet cherries locally, but I don't think sour cherries are grown in California. Most of the recipes I've looked at call for canned cherries, so the quantities are in number of cans. I'd love to try some fresh ones. A pound would be great! It would make some tarts, anyway. Maybe we can do some sort of produce swap. David, your Torta di Patate looks magnificent! Ditto your rustic sour cherry tart. There's my next dinner party just waiting to happen! How could anyone into baking - or food generally - NOT want to give these wonderful looking dishes a go? Thank you for your post! David, your tortas look great and I'm sure they taste the same. As a long time traveler to that part of Italy, you've made me hungry to go again soon. Very nice. This is the kind of dish which every family probably made with its own variations. I would agree with Louie that sharing one's own special twists would be in the spirit of TFL, but, if keeping your family's "secret ingredient" secret makes you happy, so be it. Maybe I missed it but is there a link for the rustic fruit tart recipe? It looks delicious in that photo! I cannot remember what recipe I used for this tart. My apologies.